A subtle but dramatic update to one of our classics (cos that's how we roll, hehe!) - here's the Moonshadow Mausoleum Skirt! 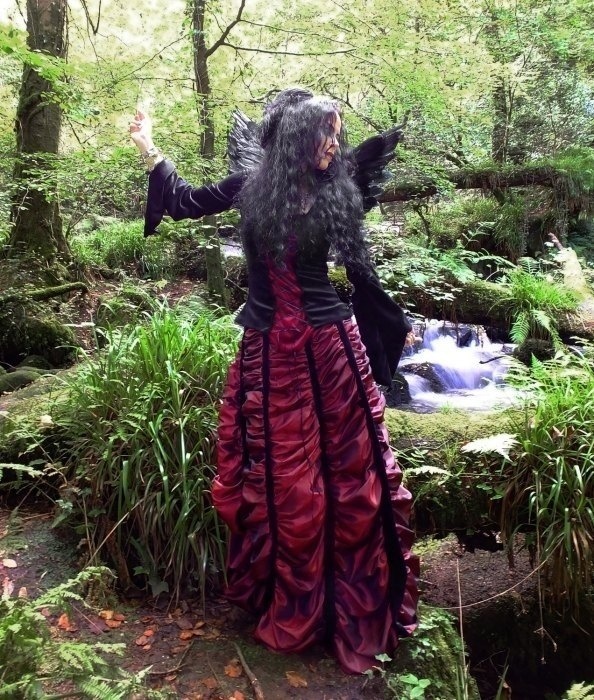 <br> <br> Made this time in taffeta and steamed velvet, it has an elasticated steamed velvet waist, this skirt looks amazing in any colour combination; it's shown here in Black and Claret - see below for more colour options! <br> <br> The Mausoleum panels are made from Taffeta, flaring out at the hem and gathered all the way from waist to floor, into steamed velvet panels - also slightly flared to give this skirt even more of an epic hem than the original! It's just gorgous!!! :D It's worn here with ourEledhwen Maiden Top! A subtle but dramatic update to one of our classics (cos that's how we roll, hehe!) - here's the Moonshadow Mausoleum Skirt! Made this time in taffeta and steamed velvet, it has an elasticated steamed velvet waist, this skirt looks amazing in any colour combination; it's shown here in Black and Claret - see below for more colour options! The Mausoleum panels are made from Taffeta, flaring out at the hem and gathered all the way from waist to floor, into steamed velvet panels - also slightly flared to give this skirt even more of an epic hem than the original! It's just gorgous!!! :D It's worn here with ourEledhwen Maiden Top!